This apple walnut cake recipe is a great way to enjoy fresh apples. 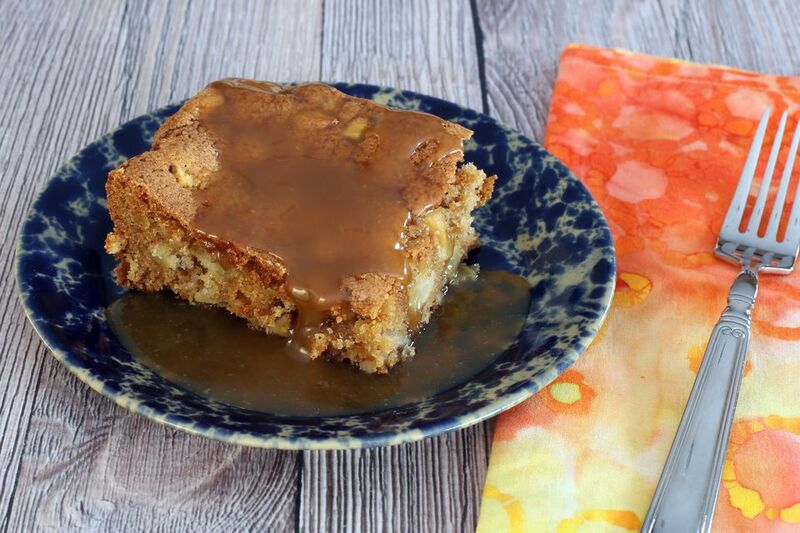 Serve this moist apple walnut cake with the included butterscotch sauce or a purchased caramel or butterscotch sauce. Or serve the apple walnut cake warm with a scoop of vanilla ice cream or drizzling of heavy cream. I used half brown sugar in the cake pictured. In a bowl, combine the flour, baking soda, cinnamon, and salt. Stir to blend the ingredients thoroughly; set aside. In a large mixing bowl with an electric mixer, cream together the 1 cup of butter and granulated sugar until light and fluffy. Stir in 1 1/2 teaspoons of vanilla. Stir the flour mixture into the batter until well blended. Stir in the chopped apples and walnuts. The batter will be thick. Spread the cake batter into the prepared baking pan. Bake for 40 to 45 minutes, or until the cake is browned and a wooden pick or cake tester inserted in center comes out clean. Cool for at least 30 minutes before serving. Serve with butterscotch sauce (below) or a purchased dessert sauce. The cake is also delicious with whipped cream or whipped topping, or serve it warm with ice cream. In a wide-bottom saucepan or saute pan over low heat, combine the butter, brown sugar, and 1/4 cup of heavy cream. Cook stirring, until smooth and hot. Increase the heat to medium-low. When the sauce begins to simmer with bubbles all over, set a timer for 3 minutes and continue cooking without stirring. Remove the sauce from the heat and stir in the remaining 1/3 cup of heavy cream, taking care not to scrape the sides or bottom of the pan. Pour it into another container or a canning jar and stir in the vanilla. Let stand until cooled. The sauce will thicken as it cools. The recipe makes about 1 1/4 cups of butterscotch sauce. Refrigerate unused sauce in a covered container for up to 2 weeks. Warm the sauce in a saucepan over low heat or in the microwave on 50% power. *I used 1 cup of brown sugar and 1 cup of granulated sugar in the cake.